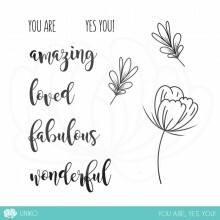 Welcome to another fun year here at Uniko. 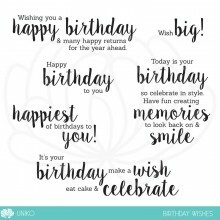 I am super excited to share another year of what I love… my designs, products and creations with you. 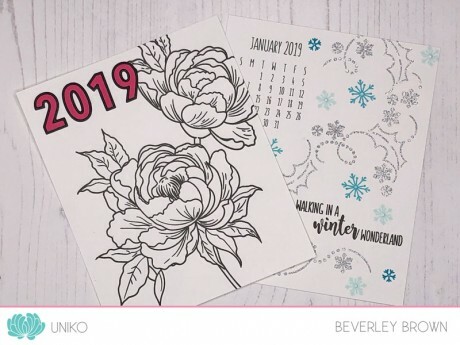 These are so fun to make and are totally customisable, today I am sharing the front cover & January. 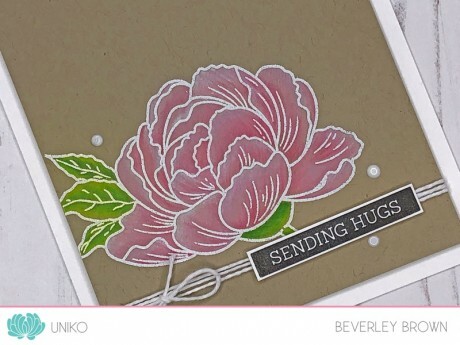 For the front cover I couldn’t resist using the recently released Pure Florals: Peony. 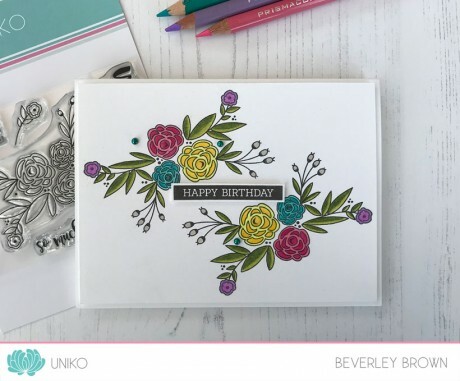 It is such a beautiful statement flower and as I have shown previously it looks stunning even when it is left uncoloured. The die cut numbers I have used are the Concord & 9th Double Cut Numbers. 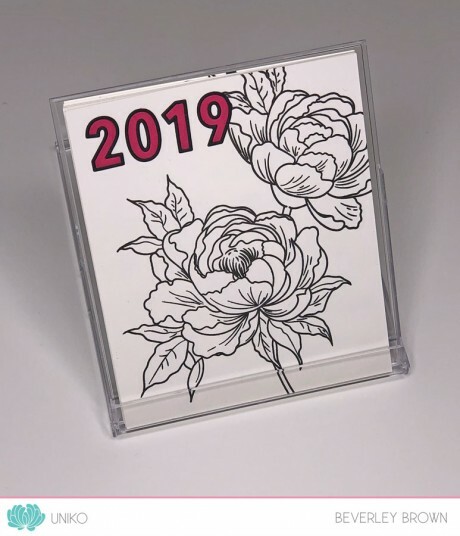 They are such fun dies and the perfect size for this calendar and cards. Obviously it is only correct to start in month order, so here I have paired the front cover with January. 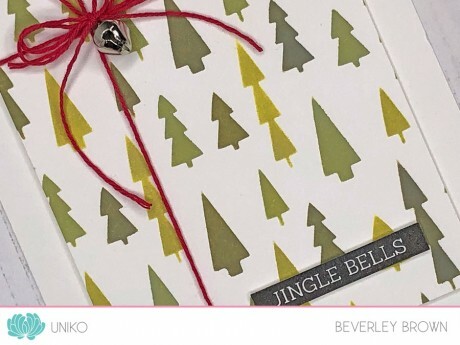 As the November Uniko Stamping Retreat’s main focus was the upcoming December Release products, I ‘had’ to use Snowflake Serenade! 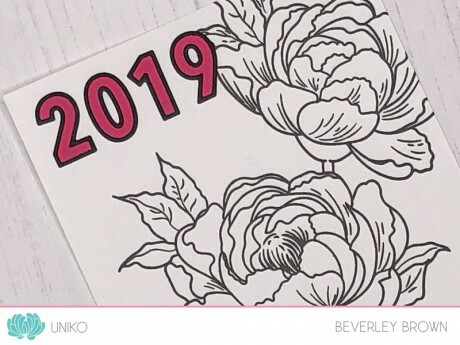 That’s all I have to share today of this 2019 Desk Top Calendar, I will be back tomorrow with more months to share and at the end of the feature I will share a link for you to download and print the pages I created myself in Photoshop. 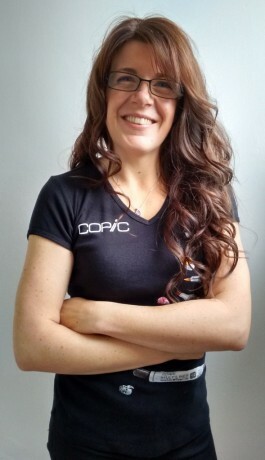 Thanks for taking the time to stop by today and Happy 2019! I do hope you are having a good weekend so far? It’s been a sick one here at Uniko HQ as I currently type my post on my laptop from bed! Urgh, the joys of 3 years olds and the germs they bring home from nursery! Anyway, enough with that, Uniko is super duper happy to be sponsoring one of my favourite challenges this fortnight, AAA Cards. 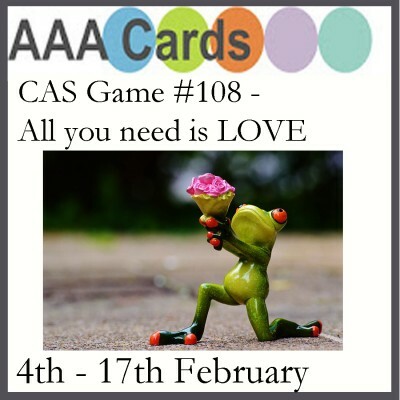 This fortnight the challenge HERE at AAA Cards is appropriately All You Need is LOVE, good if you’re like me and haven’t made your significant other a Valentine’s card yet! But what if you don’t need or send Valentine’s cards? Well, I always remember when I visited Finland with my mum around that time and my mums friend who we stayed with said that they celebrated friendship on Valentine’s Day. I think I have remembered correctly, but it’s a nice idea anyway! 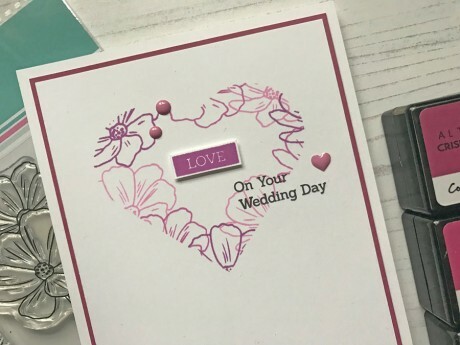 I used Pure Florals: Cosmos to stamp inside a die cut heart mask using a trio of Altenew inks. 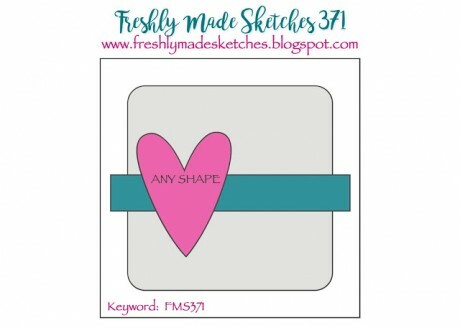 I added a mix and match of sentiments from Simply said II and Simply Said Blocks. I then finished the design off using some enamel shapes. 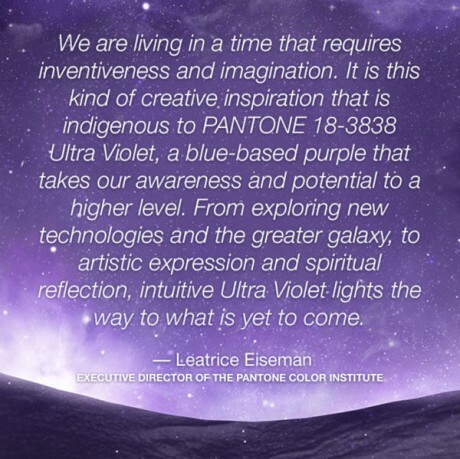 ‘A dramatically provocative and thoughtful purple shade, PANTONE 18-3838 Ultra Violet communicates originality, ingenuity, and visionary thinking that points us toward the future’. They continue to talk about how the colour suggests the mysteries of the cosmos, with intrigue of what lies ahead. The vast night sky is symbolic of what is possible and how it can inspire. 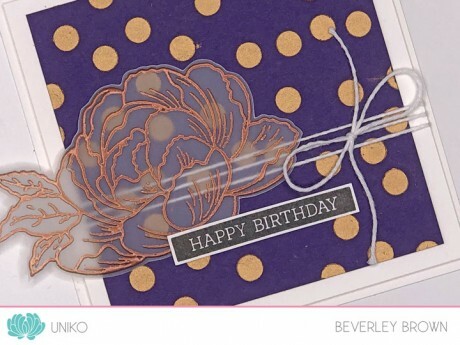 A future trend for Autumn/Winter 2018/19 is Celestial and we are already seeing this emerge within the paper crafting community with night sky/outer space background along with stars, constellations and star signs. 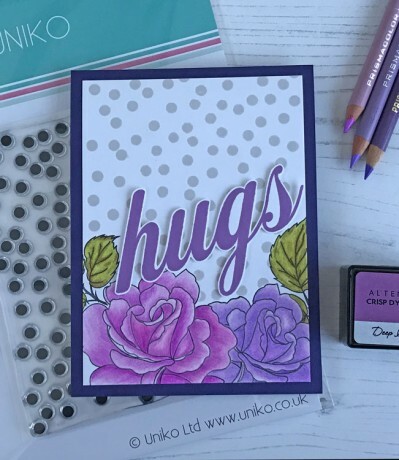 So Pantone’s Ultraviolet colour of the year pairs wonderfully with this and I am sure you will be seeing LOTS of shades of purple around blog land in the coming weeks and months. 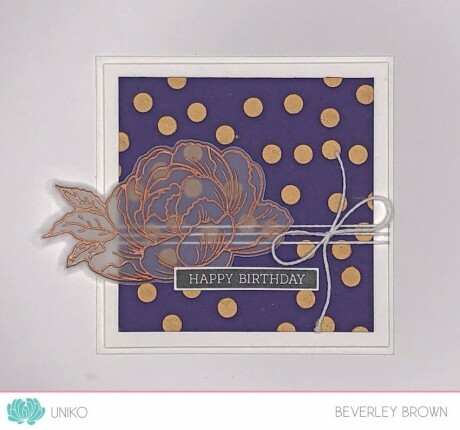 Though Uniko has a small ‘celestial’ inspired range of stamps (Background Blocks Stars, Background Builders: Seeing Stars and Reach For The Stars) however, I wanted to use shades of purple in a different way and for today’s card I decided to combine 3 of the clear stamp sets from the recent December Release. Pure Florals: Rose, BIG & BOLD Hugs and Large Background Scattered Polka Dots. I’ve not really set any New Years resolutions this year, because when I do I always seem to fail within a day or so, as they are simply unrealistic. 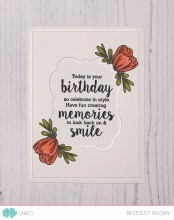 Such as trying to make a card and blog everyday. As much as I want to be able to do this, my life with being a housewife, full time mum to The Beans, running Uniko and all that is involved with a small business, is simply unachievable. I’ve seen others choose #onelittleword to live by for the year, but I can’t seem to decide upon just one word! So this year I am going to be ME. To aim high, to do my best and improve in all aspects of my life, to be kind, spread kindness and cheer. Most of all teaching The Beans all these things. 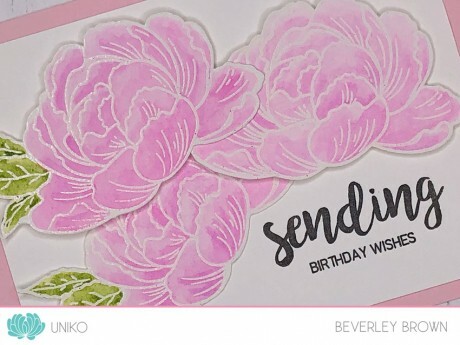 One of things I want to improve on is actually sending more of the cards I make. 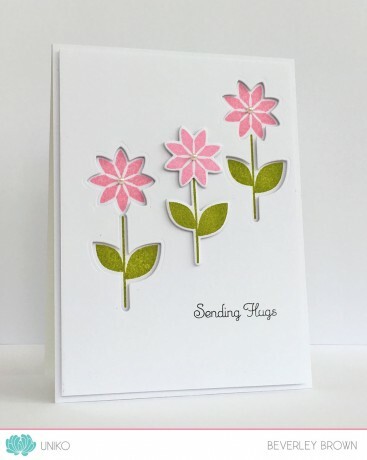 It is quite sad that many of the cards I have made in the past that don’t make it onto a sample board, sit and collect dust or hide away in a box I was proactive towards the end of 2017 and donated quite a few cards to a customer to sell for charity. 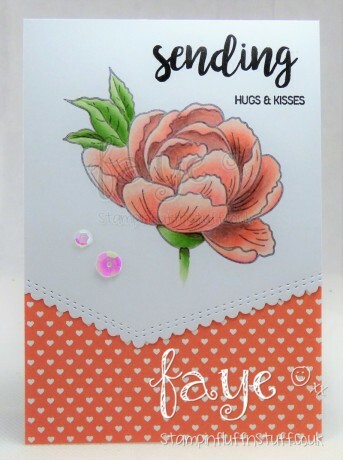 So this card was made for a purpose, to cheer someone up and to send a hug in an envelope as they are too far away to hug in person. 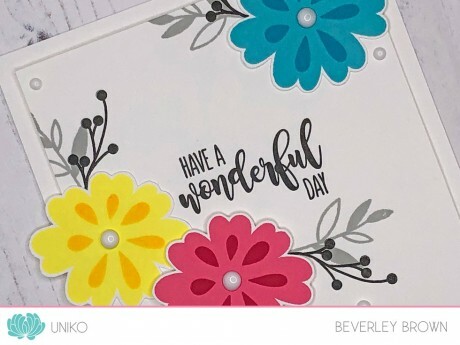 Hopefully the recipient will share this card on social media when they receive it?! Anyway, back to my card! 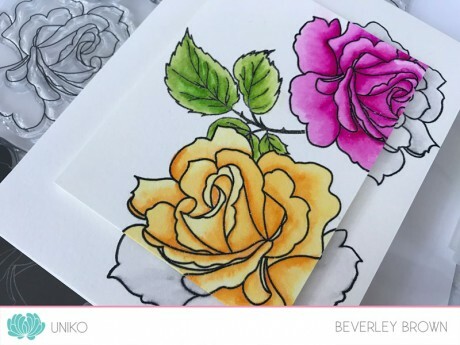 I’ve stamped the roses and leaves, masking in-between and colouring with Prismacolor Pencils. 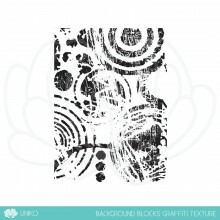 I then masked them all to stamp the Large Background Scattered Polka Dots in Altenew Limestone ink. 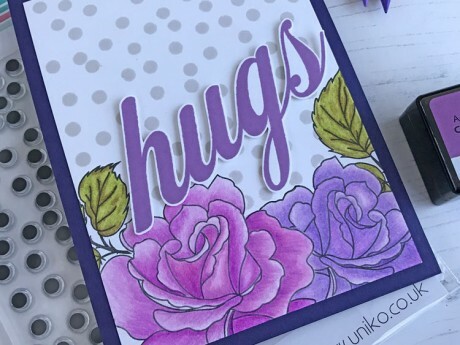 The ‘hugs’ sentiment is stamped in Altenew Deep Iris ink, fussy cut out and adhered to the card using foam adhesive. That’s all I have to share with you today, thank you for stopping by & I hope to be back tomorrow (I’ve a Bean Free Day) with more to share. Finally the day has arrived and the Uniko December Release is NOW available to purchase HERE on the website. 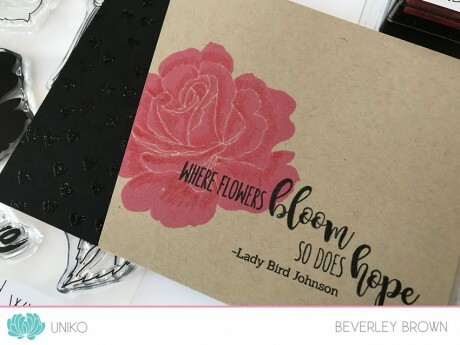 We have our traditional Reveal, Release, Blog Hop & GIVEAWAY! 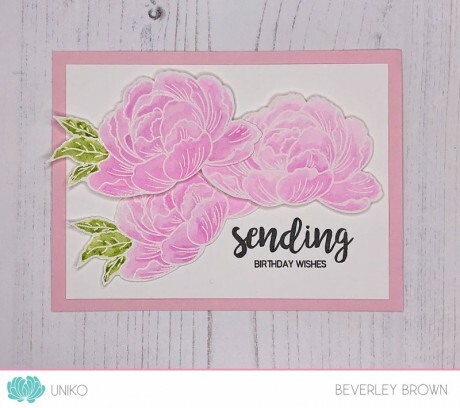 Hopefully you have hopped over from the Uniko Blogspot blog HERE, where I have formally introduced all EIGHT new products lining the shelves! 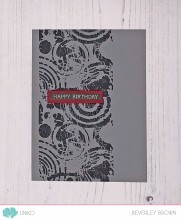 We have 5 new clear stamp sets AND 3 NEW Uniko Stencil Designs!! 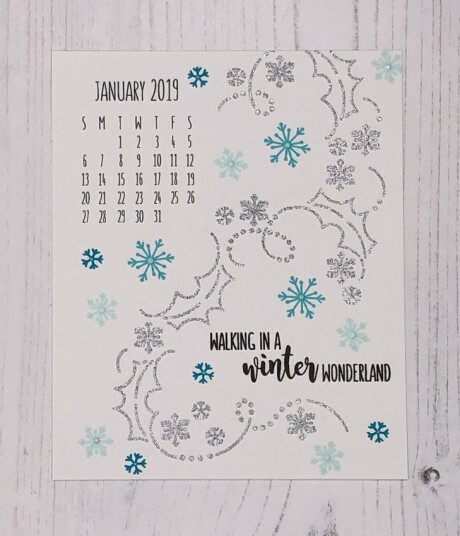 Plus I have a little December Release FREEBIE for orders of £20 or more while stocks last. 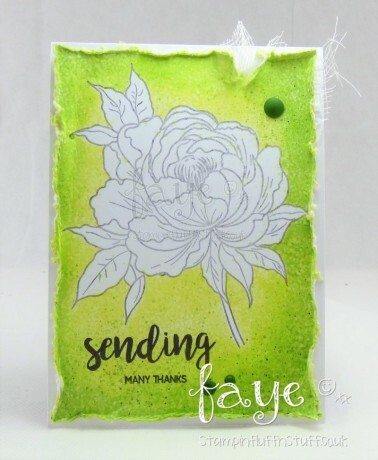 I decided to ink up Pure Florals: Rose again, this time using the large solid bloom. 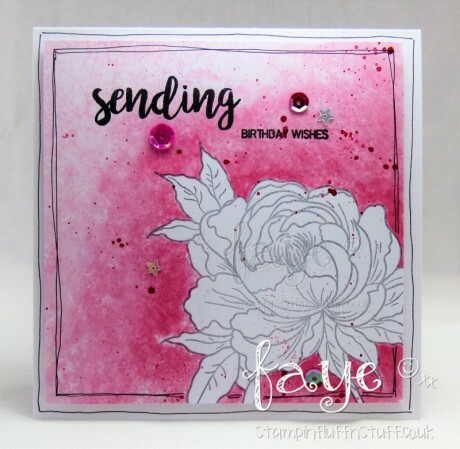 I’ve stamped the bloom on kraft card using Altenew Coral Berry ink. 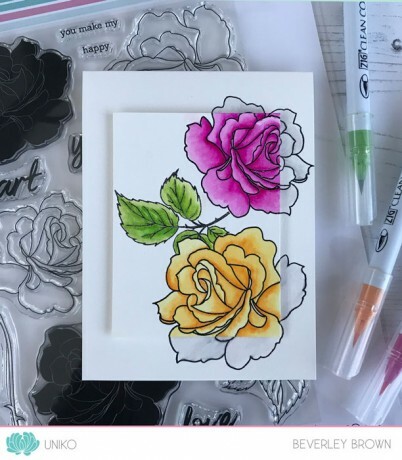 After stamping the sentiment in VersaFine Onyx Black ink, I then went in with a red Prismacolor pencil and added some shading to the petals of the rose. 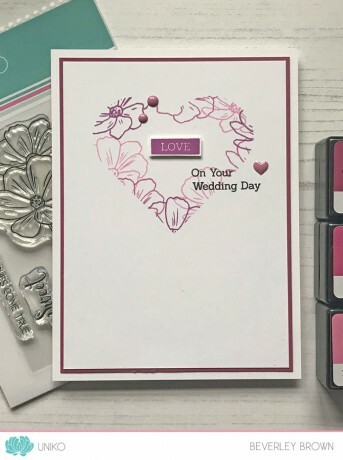 I finished the edge of the card off by stamping Large Background Scattered Polka Hearts in VersaMark ink onto black card and embossing with clear embossing powder. 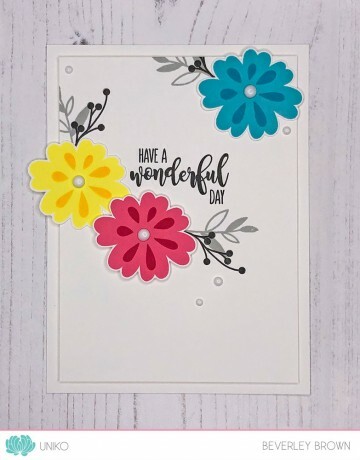 I’ve used my MISTI tool to stamp the floral bouquet and simple rotated my white mat layer 180 degrees and stamped again to get the mirrored effect. 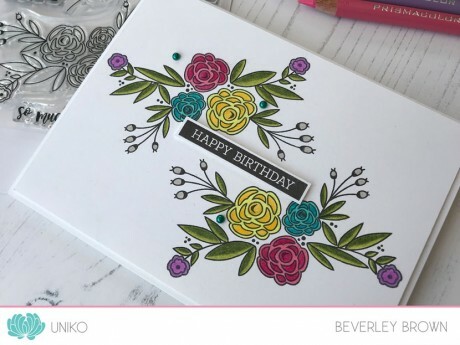 The flowers are coloured with Prismacolor pencils and the sentiment is from Simply Said Blocks. Be sure to comment along the hop for your chance to win the ENTIRE December 2017 Release!! You have until Midnight (GMT) Saturday 23rd December 2017 to comment and the winner will be announced Christmas Eve Sunday 24th December 2017! Welcome back to the final day of the product introductions for the December release. This is the exciting bit where you get to see the sneak peeks in action! 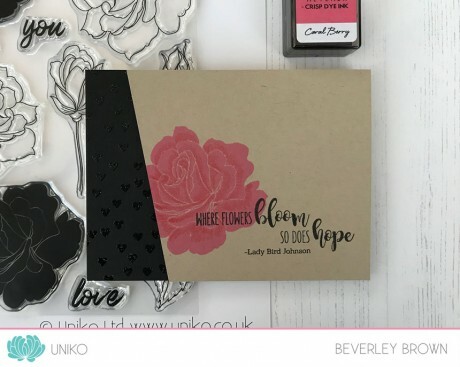 Today myself and my awesome Design Team are introducing the next clear stamp set in the Pure Florals series, Pure Florals: Rose. 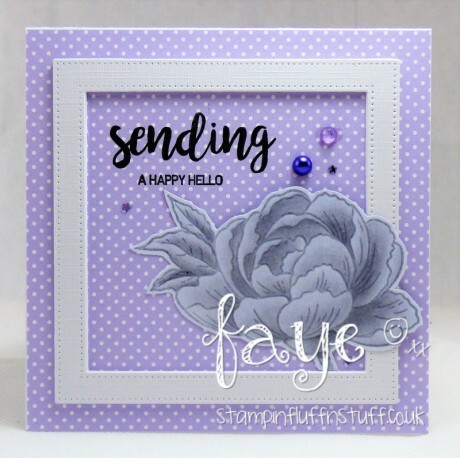 Hopefully you have hopped over here from the start of the hop HERE, where I have shared another CAS card using this clear stamp set. I’ve had a small collection of Zig Clean Colour Brush pens for far to long and most of them have sat unopened and unloved. So it was the perfect chance to give a few of the colours a whirl! Now, I struggled a little, first stamping in Memento Tuxedo Black ink, but I found this to run when adding my water to blend. 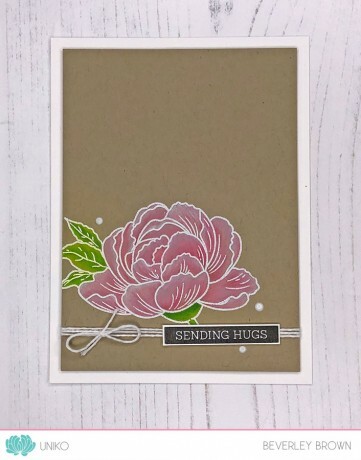 I didn’t mind this so much for the flowers peeking out on the base card as I wanted grey shading. But for the top coloured panel I ‘cheated’ a little and I heat embossed the images with clear embossing powder! 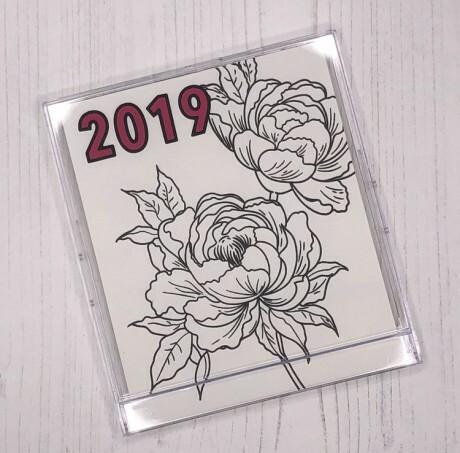 I hope you enjoyed the hop and getting to see this new clear stamp set in action? 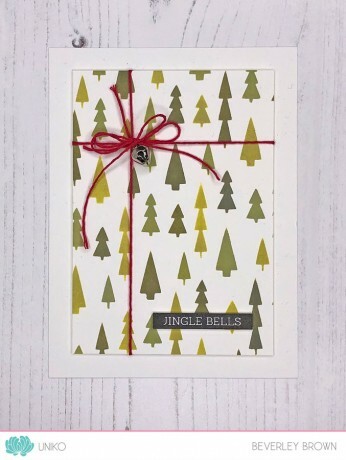 That’s all for today, but be sure to pop back tomorrow for the Reveal, Release, Design Team Blog Hop & GIVEAWAY! !